Lesson 2: What is a Good Name for a Website? By the way, this is how my PurePinkSalt.com looks at the time of writing this tutorial. It may look quite different by the time you are reading this, but I just wanted to show you how the site looked on Day 1. It’s completely empty with no content added. Your website will look somewhat similar to this one in the beginning, plain and empty, but don’t get disappointed. You are going to develop it little by little, and that’s the fun part of running your own site. In no time, your brand new website will begin looking quite professional. Ok, before we attempt to make a website, let’s get to the fundamental topic as to why we need a website for our online businesses. The answer to the question is a big YES. Your website is going to be the core element of your business because it is the place where you interact with visitors (your potential customers) and build bonds and trust. Many of you must go to the same hair salon to get your hair done, the same store to buy shoes, and the same restaurants to dine out. Why do you keep going there? It’s because you trust people who assist you and value their service or products due to past experiences, isn’t it? No trust, no business is the rule in this world, and online business is no exception. First and foremost, you need to strive to provide values for your visitors. Then and only then, visitors to your website may become customers. Particularly in the case of internet business, where we don’t get to interact in person, quality and sincerity speak volumes. Even in the physical world, for example, you wouldn’t trust a hair stylist who is offering the service on the street, would you? No matter how sincere she sounds, how experienced she seems to be, or how beautiful her smile is, you would still feel hesitated to pay money to receive her service. What would you feel if it were in the virtual world? Would you feel comfortable enough to purchase something from someone who you just encountered online on Facebook or Twitter? No, right? As an online entrepreneur, you must provide a place for people to feel who you are through what you say, interacting with you when they wish to and bond with you. It is the place for you to showcase your knowledge, display your enthusiasm, and let visitors feel what you have to offer. It is the only place you can connect with your potential customers. This is why you can’t run a successful online business without a website. But Creating a Website is Difficult, Right? No, that’s not the case anymore thanks to a CMS (Content Management System) like WordPress. Creating a website has become as simple as making a new Facebook account nowadays where you don’t need to know any coding. This site you are looking at right now was created 100% by me and I didn’t know anything about building a website. Of course, it has become more refined as I became more knowledgeable about the technical stuff. But the point is that it was a very simple website at the start and still served well enough to connect with my readers. After all, the key is not how pretty your site looks. Rather, it’s how eager you are to help people through your website. You do need a website for your online success so let’s get to work and create one to express who you are as an online entrepreneur. 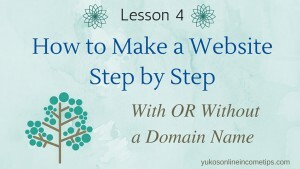 I am going to walk you through the process in both cases: with and without a domain name of your own. Don’t own a domain name? No worries. 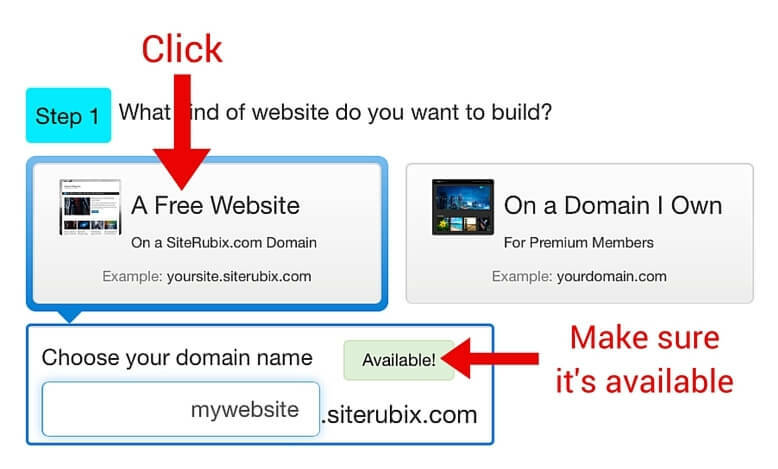 You can still launch a free, fully functional website by following these steps. 1. 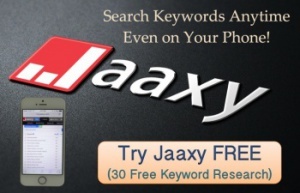 Log into your free account at Wealthy Affiliate University. If you haven’t created a free membership, you can sign up here. Here you have to pick a subdomain name. Type in the phrase relevant to your niche and see if it’s available. Please take the time to think about it and choose carefully as this is something you cannot change once registered. The only exception is when you transfer this website to a domain name that you have purchased. 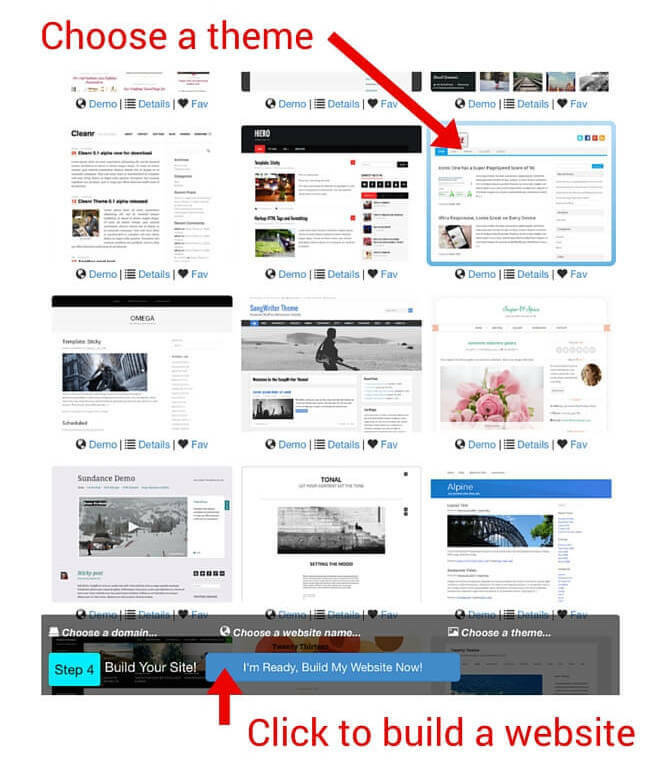 Give a title to your site. This is something you can change later if you are not entirely satisfied. This step may take a while as there are over 2,000 templates available for you to use! I advise you to pick a simple looking one with a white background especially if this is the very first time for you to build a website. You don’t need to be 100% happy with the theme at this point as it’s possible to change it later once you get more comfortable with managing a website. You can see the preview by clicking the “Demo” button under each theme. That’s all. Your free website is going to be up and running in a few seconds. 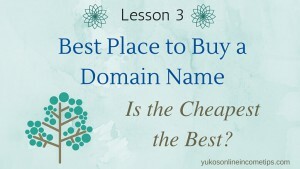 This is going to be the continuation of our prior lesson, Lesson 3: Best Place to Buy a Domain Name where I have walked you through how I purchased the domain PurePinkSalt.com. 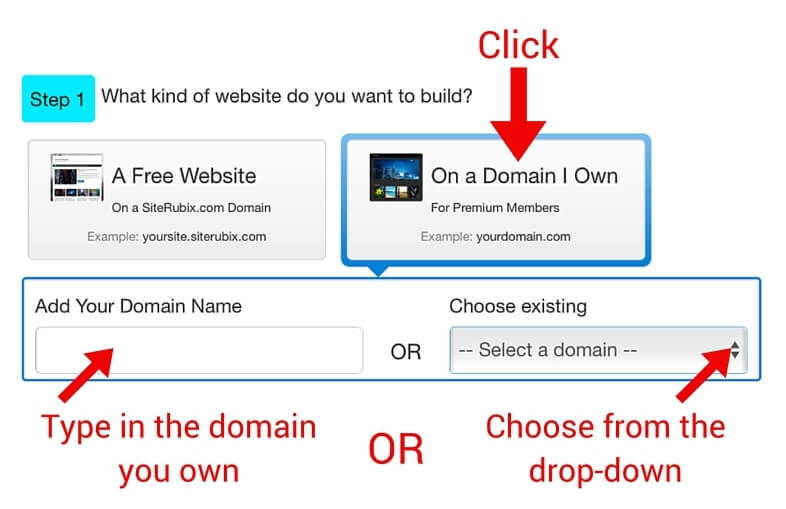 Now I am going to show you how I installed a website to that domain name. The process of creating a site with a domain name you already own is pretty much the same as a free website. The only difference is that you don’t need to check the domain availability at this stage since you have one already in place. I actually came to the Site Builder RIGHT AFTER I purchased my domain name just to see how quickly the domain would be ready to be active. To my surprise, it was already there to be selected from “Choose Existing.” It must have been only a minute after I bought it. So, I could install my new website to PurePinkSalt.com right away. I did it on purpose so that I could speak from experience for my readers of their quick domain activation at Wealthy Affiliate. But if you are going to follow this lesson and build a website with a domain name purchased at Wealthy Affiliate, you may want to wait 10 minutes or so for your domain to get activated before you attempt to install a website. They say it normally takes a couple of minutes for a new domain to register. The title of my new website is the same as the domain name, Pure Pink Salt. I typed that in. For now, I chose a very simple looking one knowing I will change it later anyway. Then I clicked on “I’m Ready, Build My Website Now!” at the bottom of the page and my brand new niche site about Himalayan pink salt came to life in a few seconds. My Brand New Site Is Up and Running! As I had already picked the title and domain name for this website, the process of creating it literally took me only a few minutes. The step I spent the longest was selecting a theme. I browsed through some of them spending 1-2 minutes. A website theme can be changed later so you don’t have to be too nervous about it. Please read through Lesson 2 and have your domain name and site title in place before you try building a new website. 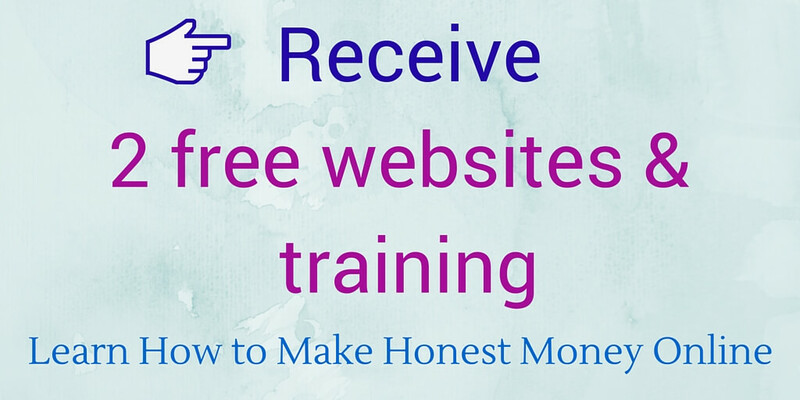 I hope this step-by-step guide on how to make a website made this process easy and stress-free for you. 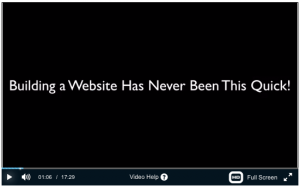 The SiteBuilder feature at Wealthy Affiliate makes this step so simple and newbie-friendly that I as a complete novice could make this website you are now looking at all by myself from scratch. If I could do it, so can you. 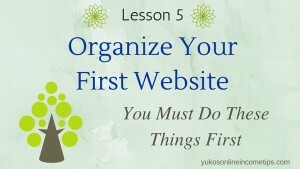 By the time you complete this lesson, your brand new website (at least, a free website) should be up and running. How exciting! Feel free to leave any questions and comments regarding this lesson or anything. See you in the next lesson! 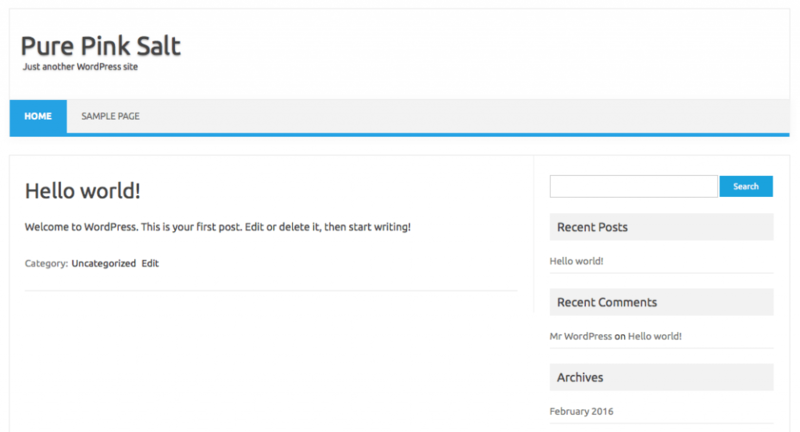 Be the first to comment on "How to Make a Website, Step by Step Guide"